Hello everybody and welcome back to Everything Hamradio! Welcome to the final post of my Technician Class License Series! It has been a great series and I hope that you have learned at least a little something even if you already have your license. I did and I have been a ham now for about 20 years! Â In this post we are going to talk about what to do after you have finished studying for your test and you are ready to go and take it. This first thing that you need to do is find a place to take your test. If you are lucky enough, you already know someone that is a ham and more than likely they are a member of a local club and they have their own Volunteer Examiner team that can give you the test. If, however, you don’t know anyone or don’t know where to take your test at, fear not you have plenty of options. The two major Volunteer Examiner Coordinators are the ARRL and the W5YI group. Both VEC’s are pretty much everywhere in the US so you shouldn’t have a whole lot of problems locating either a testing site that is already planned out or a Contact VE(CVE) that you can contact to make arrangements to take your test. The American Radio Relay League is one of the two major VEC’s. To find a class go to the Exam Session search page to find a local testing session in your area. Enter your zip code and then make sure and select a mile radius to make sure that you get some kind of result to your search. While I am writing this post, I tried with just my zip code and results came up, but when I entered the zip code of where I work, nothing showed up unless I put in a mile radius. Once you have a result, click on the city name and it will bring up additional information about the testing session including the contact name, phone number, email address and location of the testing session. If you plan on going to the published testing session, it is a good idea to contact the contact person and let them know that you are coming so that they are aware that someone will be there. A lot of times, clubs will have scheduled testing sessions during their monthly meetings but there isn’t always someone there that will take a test. The W5YI Group’s search page is a little different as it doesn’t have a list scheduled testing sessions, but if you select your state from the drop down list, it will give you a list of all the Contact Volunteer Examiners and their contact information. It will have both their email address and their phone numbers. I am sure that everyone of the CVE’s that are listed are more than happy to make some kind of arrangement’s to give you your test. I have given and participated in probably somewhere around 100 testing sessions in the past 15 or so years that I have been a VE. Some of them have been the testing sessions for classes that we have given, some have been tests given during our monthly club meeting and some have just been someone calling to take a test. We have given tests at several different locations other than where we normally do, even gave a couple at our kitchen table before. So what should you expect when you go to take your test? Well you could be going into a room with lots of other people and taking your test or like I said before, it could be at someone’s house. As long as there is 3 VE’s there at the time of the test, it can pretty much be given anywhere! When you are going to your testing sessions, make sure that you bring a couple things. You will need to have two forms of identification with at least one of them to be a government photo ID like a drivers license, you will need also bring your payment for taking the test, which at the time of this post is $14. This fee is to be paid before your test is taken and is due even if you fail your test. 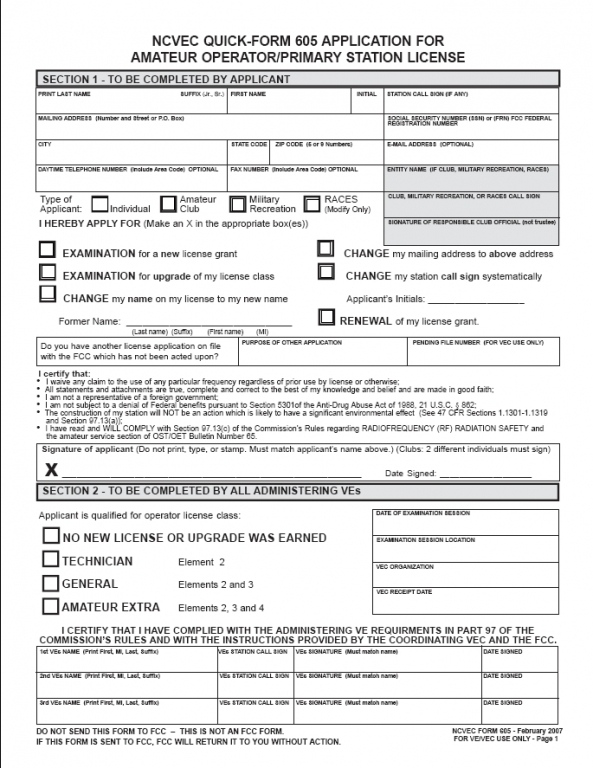 Section 1 of this form is filled out by you in black or blue ink. Make sure that you fill out this form legibly so that you don’t cause any unwanted delays in your application processing. Fill out your Last name and any suffix that you might have in the first box, followed by your first name in the next and a single middle initial in the third. If you have a call sign already and you are upgrading put your current callsign in the Station Call Sign box. Fill out your address information in the corresponding boxes. This address does not have to be a physical location of where you live, it can be a PO box or a rural route. The email, daytime phone number and fax number are all optional boxes, however, it is a good thing to put on there because if there is a problem with your application and the VEC or the team that is giving your test needs to contact you, they will have a phone number to contact you with. After you have filled out all the boxes you are on the homeward stretch! There is a couple boxes that you need to check. 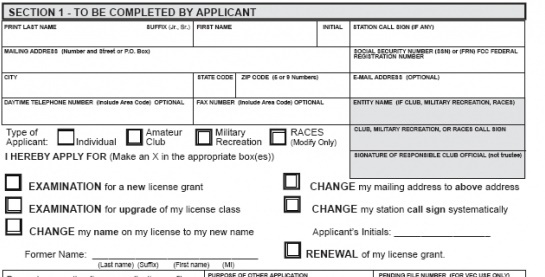 If you are a new applicant and do not currently have an amateur radio license, you would put a check or X in the EXAMINATION for new license grant. If you already have a license and you are upgraded, put a check or X in the EXAMINATION for upgrade of my license class. You can do other things with this form as well, but generally this is not normally done at a testing session. The last thing that you will need to do on this form is to sign it. Make sure that you sign it the same way as you filled out the name box above. Me for example, I would put Curtis in the first name spot. When I sign it, I would need to make sure and sign it Curtis, not Curt or C or whatever. If you do, and the VE team doesn’t catch it before hand, your application will be denied and you will have to fill out another form. Form filled out, now what? So you are all done with your 605 form, now what? Well, now comes the fun part. After you turn in your 605 form, you will be given two things, your test and your answer sheet. DO NOT write on the test itself. At the top of each test, there is a two things that you will need to put on the answer sheet, the element and the series. Being that I only give test for W5YI VEC, I’m not sure if this is the same for ARRL tests, but I’d bet that they have something like this. This basically tells the VE team which answer key to use. When I took my Extra class test, the first VE that graded my test used an answer key for a different test series and I ended up missing like 45 of the 50 questions. When I questioned them about it, they realized that it was the wrong key and I ended up passing, by how much, I don’t know because all we are allowed to tell you is that you passed or not. Once you have filled the top and you are ready to begin, make sure that you read each question carefully and fully. Some you will not have any problems with, others you might get wrong because the way the question is written if you don’t read it carefully and fully. Also, unless you are 1000% sure that you put down an answer that was incorrect, don’t change it. Of all the tests that I have given, probably 95% of the time when someone changes an answer, they had it right the first time. I have even seen people fail the test because they changed an answer to one that was incorrect. You are allowed to use a calculator on the test, however, it can not be one that has memory or programs on it and it can not be the one on your phone. Also you can use scratch paper, but it either needs to be provided by the VE team or checked before the test to make sure there isn’t anything written on it already. Also, any scrap paper that you use has to be turned in with your test. So now you are done taking your test and you have turned it in to the VE team to grade. What do you do now? Well, you wait. You will be told where you need to wait by the VE team. If you are taking the test by yourself, you can probably wait in your seat, but if you are taking it with a lot of other people, you will probably be asked to step out of the room. While you are out three separate VE’s must grade your test. Once it is all graded and you have passed, they will fill out a Certificate of Successful Completion of Examination(CSCE). When they bring it to you, you will need to sign it and you will be given a copy of it. This is what you will use to prove that you passed your test until your license is issued. If you already have a license, you can immediately start using the privaledges of the class license you just passed as long as you use a /AG or /AE after your call sign until your license is updated in the ULS database. With a new licensee, you will have to wait until your license is issued and you are given your call sign since you must have it to properly identify. First off, congratulations on passing your test! Now comes the fun part after the fun part and sometimes even the expensive part. It’s time to get on the air! To get on the air, you will need a radio and that is where the expensive part comes into place. However, you can get you a hand held(HT) radio for like $30 on amazon.com. I highly recommend that you find someone to help you figure out what your should buy before you just jump out and buy something that you might regret buying later. There are so many different options that you should consider when you figure out what to buy. The first thing that I would recommend you do is to find a club to join. This will give you access to people that have all sorts of knowledge and that can help you purchase your first radio, make your first contact and setup your station at home or car or where ever. If you are not lucky enough to already know where a club meets at, or someone that is already an amateur radio operator that can direct you, you can go to the ARRL website and find a ARRL Affiliated club near you. Unfortunately, not every club is listed here, only those that qualify and have requested to be affiliated with the ARRL. Most of all though, you need to have fun with the hobby. There are so many different aspects of the hobby that you will find interesting and keep your interested for years to come! Get on the air! That is probably one of the hardest steps that most people have after getting their license. Just jump on out there, say your call sign on a local repeater. Typically, there will be someone else listening and they may respond back to you and you can get your first contact. If you have found this series helpful, or if you have gotten your license because of this series, please let me know by leaving a comment below. I have plans on making a General and Extra class course in the near future as well, but I think I am going to do it differently than I did this series. If you have any comments or things that I could change about this series or things that I could do to make it better, please leave your comments below. I would like to thank all of my readers, both any new readers I have or that find this page/series and to those that has subscribed to my site, or follow me on Facebook, Twitter or the other social media pages that I have. Links to all my social media pages can be found on the menu at the top of the page under social.